500g loose leaf Organic Paraguayan Yerba Mate produced without the use of chemicals. A high grade yerba that can be enjoyed as hot mate, or iced mate (terere). This yerba mate Pajarito Organic blend is of the highest quality. It is grown and processed without the use of any chemicals this is yerba mate at its purest! Pajarito is one of the most popular and most important brands of yerba mate in Paraguay. This yerba has a smooth blend and high stem content. Which makes it perfect to brew both hot mate and ice cold, refreshing tereré. The tradition of drinking yerba mate is such an important part of the South American culture. This is specifically the case in Uruguay, Paraguay, Argentina and Brazil. It is also enjoyed in other South American countries. Typically, it is drunk from a natural gourd (a hollowed out fruit) used as a cup. The drinker sips the infusion through a metal straw known as a bombilla The bombilla has a filtered end to separate the infusion from the yerba leaves. In Paraguay it is more traditional to enjoy mate or tereré from a Guampa (mate cup made from horn) or a wooden cup, but of course, Para guayan yerba is just as suited to drinking from a natural gourd, or any other type of mate cup, of course with a bombilla! 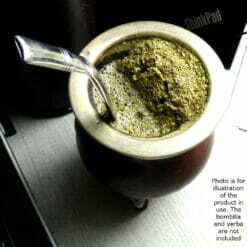 Instructions on how to brew hot yerba mate can be found here, and how to brew terere (cold mate) here. Love the Amanda brand and especially this one as it’s organic, it is rather a strong blend so I have to use half of what I normally do with Kraus. Very balanced blend of Yerba and a good pick me up for the afternoon.